This last week included an unexpected high, and a pretty dismal low. On Thursday, HP released a free promo code for TapNote. In a matter of hours, my userbase had increased roughly 600%. This was a completely unexpected windfall (the first I heard of the promo was a user emailing me to ask about it), and if all those people enjoy TapNote and tell their friends, could provide some nice long-term benefits to the app. It was also a nice bit of validation for the time that I’ve been continuing to dedicate to the platform. And then on Saturday, my partner’s grandfather unexpectedly died. It was quite a shocker, because in the flurry of the moment everyone forgot to mention that he had passed away (last we heard before heading down to the hospital was that he was in the ER and being transferred to a room), so we showed up at the hospital, were told, “He’s in the room down the hall if you would like to see him”, and walked in to find little but an earthly shell. Although I didn’t know my partner’s grandfather very well, her family’s grief and shock resonated strongly thanks to the recent death of my own grandfather, who died suddenly in mid-July. My partner’s family is sure to be telling lots of stories as they work through their own loss, and for that I can but listen. However, there is a story I have been meaning to tell about my own grandfather that I wasn’t able to adequately formulate when I first lost him, and the events of yesterday once more brought it to mind. People claim that grandparents don’t have favorite grandchildren, but what do they know? 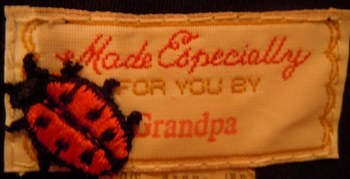 I was this close to being my grandfather’s favorite when I was young. But then I totally blew it. My grandfather spent most of his working life as a Boeing engineer, and although he never said it out loud it was pretty clear that he hoped his grandchildren would discover the joys of science and engineering. So when I took a class on technical drawing in junior high in order to fulfill one of my art requirements, Grandpa immediately sent me a T-square, a miniature draft table, and come Christmas several years worth of subscription to a magazine called Invention & Technology, whose topic matter was about what you’d expect. But I hated drafting. Drawing precise diagrams of simplistic machines was fantastically boring and I didn’t care to develop the spatial reasoning necessary to get absorbed in considering an object from all sides at once. And even though I had never heard of CAD software at that point, I still had the sneaking suspicion that the whole exercise was outdated. As a result, the T-square and drafting table went in my closet to gather dust at the end of the class, and I forfeited the standing of favorite grandchild before I realized it could be mine. I don’t mind. Because although I never found much to engage me in the lackluster science courses offered by the local public schools, Grandpa ended up teaching me something more important. For me, childhood and my grandfather are inextricably intertwined. 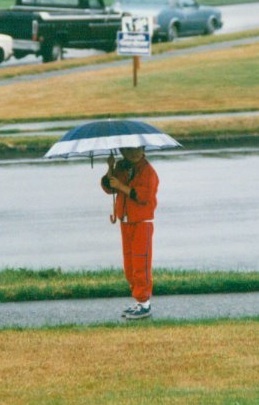 One of my earliest memories is of jumping in rain puddles wearing one of the bright red Gore-Tex jackets that Grandpa would make yearly for his ever-growing grandchildren. If you are not familiar with Gore-Tex, it is the only fabric I know of that is truly waterproof. Unlike the “water resistant” junk that stores sell that bleeds through in a matter of minutes under any decent downpour, Grandpa’s jackets would keep use completely dry for as long as we cared to stay out in the rain, snow, or whatever other inclement weather the Pacific Northwest cared to throw at us. Other early memories: playing with my sisters in the little red playhouse that Grandpa constructed in our back yard (complete with a shuttered bell-tower), rocking on the hand-made wooden rocking horse he made for us, exploring the intricate dollhouse (including room-by-room electric lighting) that he constructed for my sisters, climbing around in the treehouse he built in his backyard, swinging on the attached swingset, and at the end of just about all of those activities taking a trip with him down to the local German bakery where they served maple bars that were literally as long as my forearm. Grandpa was not a verbally demonstrative man. I don’t think I can ever remember hearing him tell someone he loved them. 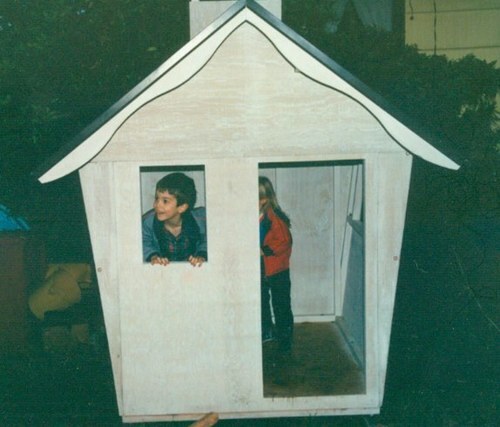 For Grandpa, love was a little red playhouse. It was careful design, hours of labor, and the reward was years of laughter and fun. Which is why I find such joy in creating things, be they websites or apps or other. Which is why I bake things. Which is why I always find time to help the people I love in areas I have expertise even if, like my grandfather, I sometimes find it hard to tell them outright that I love them.